The new crossover from Renault, christened the Kadjar, has been revealed ahead of its Geneva Motor Show appearance on March 5, 2015. Positioning the car as the Captur's bigger brother, the company says that it focused on driving pleasure and comfort while designing the vehicle. The car is a product of the Renault Nissan alliance and is built on the alliance's Common Module Family (CMF) platform. Specifically, the Kadjar sits on the CMF C/D platform. The crossover offers the option 4x2 and 4x4 drivetrains, with the all-wheel drive featuring Auto, Lock and 2WD mode to tackle varied situations. Renault says that an approach angle of 18 degrees and a departure angle of 25 degrees endows the Kadjar with decent off-road ability. The Renault Kadjar, says the company, is built to offer outstanding exterior styling with sporty interiors. The car features front and rear skid plates, wheel size options up to 19 inches and 190mm ground clearance. The front grille is flanked on either side by LED headlights which are surrounded by C-shaped daytime running lights. 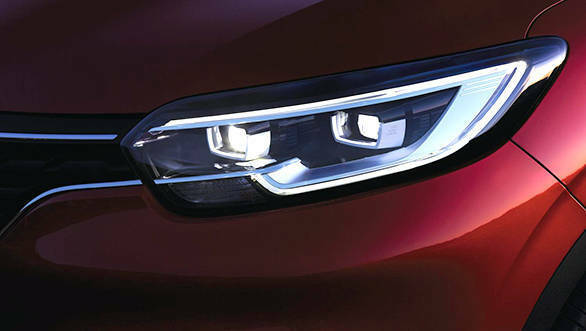 Renault say that the LED headlamps possess 20 per cent more power than a conventional halogen lamp. The tail lights are LED units too. 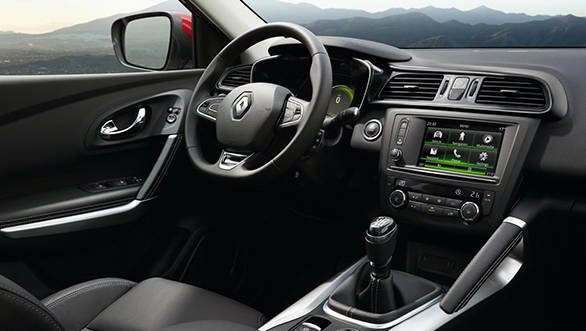 The interiors, says the company are sporty and finished in top quality materials.The dashboard contains a 7-inch TFT capacitive touchscreen display and Renault's very own R-link multimedia system that features voice commands for navigation, telephone, apps and radio. The Kadjar also has 60:40 split seats, 1,456mm of elbow room and 30 litres of storage space around the cabin. The car promises the convenience of various driver aids such as hands-free parking , reverse camera, lane departure warning, emergency brake assist and road sign recognition. The car also boasts extremely good manoeuvrability with a turning radius of 10.27 metres, says the company. 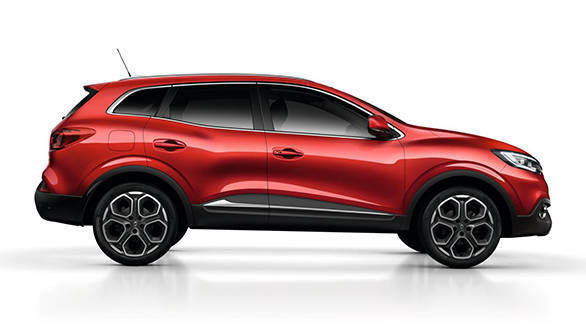 The Kadjar will be the first Renault that will be produced in China and the company believes that the new crossover will allow it to grow in the burgeoning Chinese market. The company also states that the crossover segment is witnessing a steady growth across various markets across the globe, with one in every five vehicles sold being a crossover and hence believes that the new Kadjar will boost its international ambitions. Renault which sells the popular Duster in India, amongst many other models, sold 27,12,432 units worldwide in the year 2014. The Kadjar will go on sale in Europe by summer, with launches at other international markets to follow thereafter. 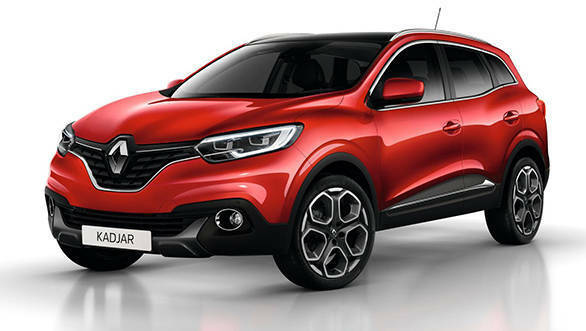 -Renault unveils stylish all-new C-segment crossover -Bigger brother to Captur set to offer excellent economy & emissions -Focus on driving enjoyment and comfort -Available in 4x2 and 4x4 versions -LED headlights and high-tech specification items -Built on the Renault-Nissan Alliance CMF platform -Kadjar will be manufactured in Palencia, Spain for Europe -Set to become the first Renault to be manufactured in China -Kadjar set to go on sale in the UK in the Autumn -Full details to be released at the 2015 Geneva Motor Show Buoyed by the success of Captur, Renault is continuing its offensive in the world of crossovers with the launch of Kadjar, the brand's first C-segment crossover. In a fast-growing and extremely popular area of the market, Kadjar will boost Renault's ambitions on the international stage, as it is due to go on sale initially in Europe and in many African and Mediterranean Basin countries, followed by China. This sibling to Captur shakes up established thinking by bringing an innovative and attractive proposition to the crossover market. The Renault Kadjar stands out through its fluid, athletic exterior styling. Meanwhile, its interior is both sporty and refined, courtesy of the quality of the materials employed and the attention that has gone into its finish. Available with either four- or two-wheel-drive transmission, the Renault Kadjar encourages adventure while at the same time delivering easy manoeuvrability in town thanks to its compact footprint (4.45 metres long x 1.84 metres wide). Furnished with high-quality interior appointments and modern equipment, the Renault Kadjar offers advanced connectivity with the R-Link 2® multimedia system, along with a relaxed experience behind the wheel, courtesy of the latest driving aids. The Renault Kadjar also benefits from a range of particularly efficient engines which position it at the forefront of the segment in terms of low fuel consumption and CO2 emissions. The Renault Kadjar will be unveiled to the public at the 85th Geneva Motor Show which opens to the public on 5th March 2015. It will go on sale in the summer in both Europe and a high number of countries in Africa and the Mediterranean Basin region and is scheduled to appear in RHD form in the UK in the Autumn. KADJAR, A GLOBAL MODEL IN LINE WITH RENAULT'S INTERNATIONAL AMBITIONS Buoyed by the success achieved by Captur, Kadjar is the latest addition to Renault's dynamic product plan. In the fast-growing crossover market, Kadjar is Renault's vision of a C-segment vehicle. Renault extends its crossover range With Kadjar, the Renault Group has showcased its creative ability with a view to conquering new markets and winning over new customers. The dynamism of the current product offering is reflected in the average age of its range, which has decreased from 4.8 years in 2012 to 4.2 years in 2014. It is expected to reach 3.7 years by the end of 2015. In 2014, almost one in every five vehicles sold across the world was a crossover, with the segment enjoying a market share of 23 per cent in Europe and 26 per cent in China. The segment consequently represents a real entry point to the key growth markets targeted by the group. Captur was the second model to appear in Renault's crossover range after the Renault Koleos, Success was immediate. Thanks to its practical innovations and bold personality, this urban crossover emerged at the top of the European B-segment crossover market, with slightly more than 178,000 registrations in 2014. Kadjar sees Renault maintain its offensive in this international segment with a C-segment model that slots into the range above Captur. Kadjar, Captur's big brother, brings something new to the segment thanks to its fluid, athletic lines, status-enhancing appeal, travelling comfort and respect for the environment. Kadjar, a vehicle to drive Renault's international growth Represented in some 128 countries, the Renault Group sold a total of 2,712,432 vehicles worldwide in 2014. Courtesy of its international growth strategy, Renault now markets 46 per cent of its vehicles outside of Europe (compared with 37 per cent in 2010). The Renault Group's product plan is the cornerstone of this growth and of the promotion of its image. Kadjar will contribute to the group's expansion by extending its range and geographical scope. Kadjar to fuel Renault's ambitions in Europe and the Mediterranean Basin Kadjar will be manufactured at Renault's Spanish plant in Palencia which currently exports 83 per cent of its production to more than 50 different countries across five continents. Kadjar will go on sale this summer in Europe, followed by the majority of the Mediterranean Basin countries and Africa. In China, Kadjar is poised to spearhead Renault Group's offensive Kadjar will be the first Renault vehicle to be manufactured in China. The new crossover will act as a powerful ambassador to drive the group's growth in China. Having registered just 600,000 car sales back in 1999, China has evolved into the leading global market, counting more than 22 million units in 2014. In December 2013, the Renault Group formalised the creation of a joint venture with Dongfeng and consequently began the construction of a factory in Wuhan with an initial production capacity of 150,000 vehicles. Kadjar will be the first Renault vehicle to be manufactured in China On 16th December 2013, Renault and Dongfeng signed an agreement that gave birth to the Dongfeng Renault Automotive Company (DRAC) and the construction of a factory in Wuhan. Work on the factory began in January 2014, with vehicle manufacturing scheduled to start early in 2016. Today, a little more than a year after the agreement was signed, DRAC already employs a staff of 1,000 in China. In the medium term, Renault's plan is to achieve a 3.5 per cent share of the Chinese market  equivalent to 750,000 sales per year. UK and European Kadjars will be supplied from the Palencia plant in Spain. The success of crossovers is global and the segment accounts for almost one in every five vehicles sold across the world. Demand is similarly common across the planet, with major selection criteria being design, price and image. With Kadjar, a special effort was made to meet the expectations of the segment's customers. Its fluid, dynamic stance is a response to the demand for attractive styling. A crossover with Renault's DNA built on one of the Alliance's common platforms Strategic partners since 1999, the Renault-Nissan Alliance sold 8.4 million vehicles in almost 200 countries in 2014, positioning its world's fourth largest automotive group. Renault and Nissan stepped up their synergies in 2014 after identifying potential for convergence in four areas, namely purchasing, human resources, manufacturing and logistics, and engineering. Each of these four activities was placed under common management in order to improve efficiency. In the realm of engineering, one of the primary objectives has been the development of common platforms. Kadjar has benefited from the synergies permitted by the Alliance since it is built on a platform that is shared by both makes. The development of modular architectures for use by the Alliance is a consistently growing source of synergy. The CMF plan (Common Module Family) consists of producing a wide range of vehicles using a raft of shared parts and components. The benefit is a reduction in costs through the manufacture of a broad range of models using a fewer number of different parts. These savings are reinvested in the vehicle, resulting in more attractive products by allowing special attention to be paid to the sort of functions and content that customers want. The CMF project is broken down into three segments: CMF-A for small vehicles, CMF-B for medium-size vehicles and CMF-C/D for the largest models. The Renault Kadjar uses the Renault-Nissan Alliance's CMF-C/D platform which is the fruit of four years' joint development. The platform's production is shared between Renault and Nissan, with Renault bringing its knowledge and experience to the design and manufacture of the rear suspension and transmissions. Already proven by three Renault and Nissan vehicles, the CMF-C/D platform is an eloquent illustration of the Alliance's expertise in the crossover segment. The synergies developed by Renault and Nissan permit the shared use of as many non-visible parts as possible (e.g., the engine block, navigation system architecture, etc.) while at the same time staying true to the distinctive brand identity, design and hallmarks of each of the Alliance's partners. RENAULT KADJAR, A NEW STYLE FOR THE CROSSOVER MARKET Renault is positioning itself in the C-segment crossover market with a design that blends strength and elegance. With its Flame Red launch colour, the Renault Kadjar brings a breath of fresh air to the market and plays upon its power of seduction. Fluid, athletic exterior styling The Renault Kadjar is a C-segment crossover that draws from the cues associated with SUVs, saloons and estates. It shares the DNA of the Captur concept car, along with hints of the DeZir concept car. Captur illustrates the 'Explore' petal of Renault's design strategy  a world that evokes dynamism, strength and adventure  while DeZir, the concept car born from the 'Love' petal, endows the vehicle with an emotional, sensuous touch. Kadjar is moreover presented in Renault's Flame Red colour which is emblematic of vehicles that inspire passion. The big brother to Captur brings a new proposition to the crossover market through its unique design which marks a break from the segment's current trends. The Renault Kadjar combines a bold personality with seductive appeal. Its compact footprint (4.45 metres long x 1.84 metres wide) and low roofline (1.60m) accentuate the vehicle's dynamic stance. The front end exudes an impression of strength. 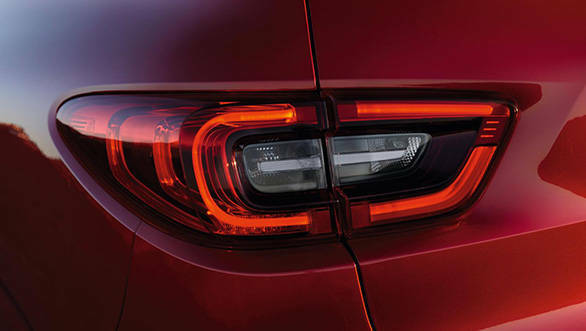 The manner in which the chrome strip continues across the head lights enhances the visual impression of width and contributes to Kadjar's assertive character. Its flowing, athletic silhouette is reinforced by the muscular form of its wings, while the sensuous fluidity of its lines is accentuated by the finish of the doors which are flush with the sills. The sculpted sides and powerful shoulders also contribute to the overall sensation of dynamism and strength. At the rear, the bodywork subtly integrates the bumper and firmly establishes the Renault Kadjar as a high-quality vehicle. Behind-the-scenes, Kadjar challenges conventional thinking Because of Renault's ambitions in the crossover segment and due to the model's international importance, Renault Design called on input from its entire international network of design centres to guarantee a truly global approach to the model. The strong ideas that came out of the Cooperative Innovation Laboratory (LCI) and RDCE (Renault Design Central Europe) ensured that innovation played a big role in Kadjar's design. The project was overseen by design teams at the Technocentre, near Paris. A seductive take on the world of crossovers In addition to its sensuous appeal, Kadjar incorporates all the indispensable cues of the crossover world. Its generous ground clearance (190mm) provides an immediate impression of strength and hints at Kadjar's ability to head off the beaten track. The structured form of the grille heightens the assertive character expressed by the front end, while the front and rear skid plates  characteristic of SUVs  underline the Renault Kadjar's adventurous temperament. The large 690mm wheels and rims of up to 19-inches (depending on version) are further pointers to the Renault Kadjar's sporty nature. The lower door protective mouldings reinforce the model's solid stance, while the black wheel arch extensions form an extension of the lower part of the body and provide another indication of the vehicle's taste for escaping the crowd, as do the anodised aluminium roof bars which add to Kadjar's dynamic poise. Kadjar stands apart from other crossovers in its segment thanks to features which bestow it with an elegant touch without taking anything away from the sensation of robustness it exudes. Renault Kadjar's strong character is reinforced by the new lighting signature which characterises the brand's mid-range and high-end models. An LED (Light Emitting Diode) light guide in the form of the letter 'C' for the daytime running lights combines a sense of status-enhancing distinction with a high-tech feel. The continuity of the chrome strip within the headlight contributes to the impression of elegance and quality exuded by the vehicle. The similarly modern rear lighting signature creates a rippled light effect, as seen on the Captur concept car. The Renault Kadjar's refined and balanced lines are emphasised by the fitment of body colour door mirror housings and door handles for all versions. Finally, the use of chrome for the windows and daytime running light surrounds, as well as for the sill guards heightens the impression of strength and quality exuded by this athletic crossover. A refined, sporty interior The Renault Kadjar offers a smart, comfortable and carefully appointed interior which mirrors the refinement of the model's exterior lines. The instrument panel falls naturally in the driver's line of sight and suggests genuine enjoyment behind the wheel. The horizontal lines of the dashboard design emphasise the width of the cabin. The Renault Kadjar's dashboard is pleasant to the touch and of a very high-quality thanks to the use of foam-backed materials. The outstanding quality of the interior combines with a precise, immaculate finish. The bold, expressive design of the gear lever serves as a reminder of the model's sporty calling and is enhanced by refined, glittering inlays. A 1.4-square metre fixed glass sun roof adds to the balanced feel and brightness of the cabin. Double rows of visible stitching for the seats, door handles and instrument panel cowling further enhance the Renault Kadjar's interior. Kadjar's personality is expressed as much inside the car as it is through its exterior styling to deliver a uniquely stylish blend of comfort and distinction. KADJAR, AN ASSERTIVE CROSSOVER TO MATCH EVERY MOOD While the Renault Kadjar's lines are honed to meet the exacting demands of customers in the segment, the model's versatility also answers the needs of families thanks to its practical, modular design. The generously-equipped Renault Kadjar benefits from a raft of relevant, intuitive technologies which contribute to an efficient, relaxed driving experience. Available with either 4x2 or 4x4 transmission, Kadjar is equally at home on open roads as it is in built-up areas. Kadjar blends a subtle combination of SUV, estate car and saloon cues, while retaining the undiluted DNA and design thinking of the Renault brand. It offers an intuitive driving experience and first class travelling comfort for owners looking to get away from the crowd. The Renault Kadjar takes its robust build from the world of SUVs. 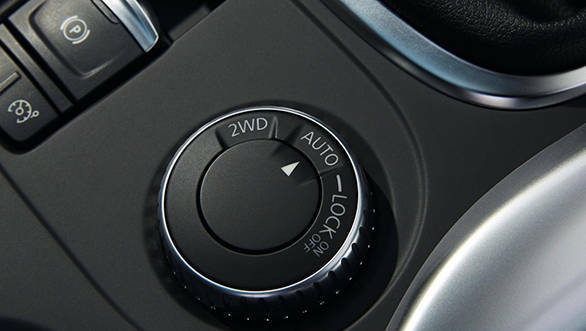 With all-wheel-drive, it offers improved traction thanks to a choice of three modes (Auto, LOCK and 2WD), allowing drivers to select the ideal transmission option for any given situation. The generous 190mm ground clearance and approach and departure angles of 18 and 25 degrees respectively guarantee outstanding driveability whatever the type of terrain. Front and rear skid plates protect the vehicle's underbody, while the stainless steel boot sill guard protects against damage and dirt. Versatility inspired by estate cars Kadjar's interior modularity is user-friendly and intuitive. Courtesy of handles located in the boot, the Easy Estate system automatically unlocks and folds the 60/40-split rear seats. The two different boot configurations make it possible to choose between a 'high' position with a completely flat floor to facilitate the loading of large items, or a 'low' position to provide a maximum carrying capacity of 472dm3. Meanwhile, the option of compartmentalising the boot into two or three sections is a smart way to protect items and prevent them from moving about while on the move. The interior offers impressive cabin space. In the back, the height-to-roof lining dimension (910mm at 14°C) and 1,456mm of elbow room are amongst the best in the segment. The Renault Kadjar also provides 30 litres of practical stowage space in the cabin. Kadjar boasts a level of driving enjoyment and comfort associated with saloon cars It takes no time at all to acclimatise to the Renault Kadjar. The angle through which the seat backs recline means that the driving position is similar to that of a saloon. The interior is refined and the comfort level peerless, thanks particularly to an excellent quality of upholstery for the enveloping seats. Kadjar is extremely manoeuvrable, too, with a turning circle of 10.72 metres. The Renault Kadjar is equipped with an array of driving aids that are useful for everyday motoring, including 'hands-free' parking and a reversing camera for easy parking in town. Finally, the Renault Kadjar boasts low fuel consumption. Its Stop and Start system enables fuel to be saved and reduces pollution in built-up areas. Quality equipment for a personalised, connected driving experience The Renault Kadjar comes with an ultra-modern dashboard incorporating a seven-inch capacitive colour touchscreen TFT display that is brightly lit to optimise the clarity of information. Kadjar is available with the Renault R-Link 2® multimedia system which is also available for the new Renault Espace. R-Link 2® comes as standard with voice recognition to control the navigation, telephone, apps and radio, ensuring a simple and safe means of accessing these functions. Its customisable home page facilitates access to the most frequently used functions. The range of available apps provides an enriched experience in every area: motoring, travel, news, social media and practical solutions for everyday life. Escapism and adventure in complete safety Kadjar benefits from Renault's expertise in the area of safety, assisted by the latest technologies designed to take care of passengers. The Renault Kadjar's head light units with Full-LED (Light Emitting Diode) twin head lights improve safety courtesy of a more intense and precise beam. The head light units incorporate two LED 'Pure Vision' modules that perform the functions of dipped and main beam. This Full LED 'Pure Vision' technology endows the Renault Kadjar with lights that are both precise and efficient. The ray emits a light close to that of the sun and 20 per cent more powerful than a halogen beam for enhanced night-time vision. All of the driving aids are accessible from the R-Link 2® menu. The extensively-equipped Renault Kadjar features a raft of useful, intuitive technologies such as emergency brake assist, lane departure warning, road-sign recognition with speed limit alerts and a reversing camera.